But, the novel also had some glaring pacing issues. The perspective switches between Vikram and Adelaide after often disorienting at first before the chapters pick up, rather quickly at times, and rather slow at others. The first thirty-forty pages of the novel are also a downright slog to get through as there is quite a bit of information provided to the reader, and a prologue that is very disorienting, and which doesn’t actually make much sense until right towards the end of the novel. Then there’s also the fact that the author failed to actually explore the Egyptian references conjured up by the name of the novel and the layout of most structures in the city, pyramids. Osiris was a premier Egyptian god, of life and afterlife in fact. In the divisions between the elite of the city and the dregs, there are hints of the “worthy are judged and those who must keep on suffering”, but for me, it wasn’t enough. It was an almost too subtle concept, and I wanted something much more substantial to latch onto, something much more obvious and easy to relate to right off the bat. And finally, the big reveal about the death of Adelaide’s brother Axe fell flat to me. It was a really good sub-plot in the narrative, but the pay-off was signposted early on and when it was “revealed” at the end, it had little emotional impact on me. It was like knowing the big twist in a thriller/suspense movie about 60% in. That’s not fun you know. Other than that though, I’d say that Swift shows a lot of promise and if the author can push further for the second novel, then the end product will be much more fun than this debut. Swift’s writing, by itself, is quite impressive, just, the author should have more clarity in the narrative, both in terms of content and a consistent voice. Posted on December 2, 2012, in 2012 Reading Challenge, 2012 Writing Challenge, Book Reviews and tagged 2012 Debuts, 2012 Reading Challenge, 2012 Writing Challenge, Book Review, E. J. 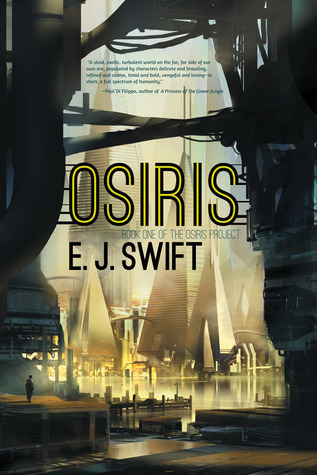 Swift, Night Shade Books, Nightshade Books, Osiris, Osiris Project, Post-apocalyptic dystopia, Science Fiction. Bookmark the permalink. 5 Comments. I’ve been looking at this title for a while now, and I completely agree that Nightshade has been putting out amazing titles lately. I’m trying to get hooked on some brand new authors as well, so Swift fits the bill – brand new, and vetted by NSB. it’s ok if the beginning is slow, I usually try to get thru the first 100 pages of a book in the first sitting, so by then I aughta be past the slow bits. My usual process is to give the book about 60 pages worth of leeway to get me hooked and reading. Sometimes I break that rule if a book was requested by me, or if I really promised a review. But yeah, do let me know how you find the book!